Department of Agricultural Economics (DAE), to be in line with the development of other sectors in Republic of the Union of Myanmar, is providing the well qualified teaching services which could support the developments of agriculture, economy, rural areas and human resources. Moreover, DAE is also providing the non-degree trainings and education programs to farmers. 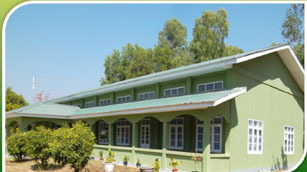 The objectives of DAE are to produce competent professionals in agricultural economics by providing the qualified students and researchers educating with the basic agricultural economics subjects (Microeconomics, Agricultural Trade and Marketing, Farm Management, Macroeconomics, Natural Resource Management, Project Planning and Management, Research Methodology, Econometrics, Survey Design, and Rural Development Policies) who can improve enhancing rural and agricultural development. The role of DAE is very important under the policies of rural development and poverty alleviation of the government. DAE is offering the farm management for improving incomes of farmers as well as producing well qualified students and professionals according to the demand of labor market which is shaping the reciprocal learning education system among farmers and agricultural economists. DAE is also trying to develop and distribute the agribusiness related knowledge and experiences which would lead the way towards sustainable development with the least effect to environmental degradation. DAE is currently collaborating with many local and international organizations, universities and research institutes under the leading role of academic board of Yezin Agricultural University. DAE is continuously trying by contributing the evidences based findings of agribusiness related researches for the policy recommendations towards rural development. The courses offered by DAE for undergraduate and postgraduate programs during 1st and 2nd quarters of 2017-2018 fiscal year (that means 2nd semester of 2016-2017 academic year and 1st semester of 2017-2018 academic year) are presented in the tables aside. During 2017-2018, DAE could produce one Ph.D degree holder and 9 Master degree holders. There are total 15 postgraduate students including master students, Ph.D candidate and research based Ph.D candidates during 2017-2018. (1) Economics of fertilizer use efficiency for economically important crops in Tatkon Township. (2) Economics of fertilizer use efficiency for rice production in Taungoo Township. (4) Marketing analysis of vegetables, fruits and flowers in Nay Pyi Taw. (1) Economic perspective of crop diversification in the selected areas of Myanmar. (2) Local level institutional analysis on Department of Agriculture, Chaung Oo Township. (3) Study on the determinants of labor migration in Maubin Township. (1) Role of gender in technology adoption of rice production in Thazi Township, Dry Zone, Myanmar. (5) Role of perennial crops in rural household income in central dry zone of Myanmar under the climate change scenario. (6) Profitability of labor use efficiency of different rice varieties with different crop establishment methods in Maubin and Daik U Townships. (7) Impact of gender on rice production activities of rural households in Maubin and Daik U Townships. (5) Agricultural livelihoods and coping strategies to flood in farm households in Kambalu Township. (6) Analysis of farmers’ perceptions and adaptation strategies to climate change in Yamethin Township. (7) Assessment on the livelihood activities of rural households in Magway Township. (1) Farmer participation in irrigation management: The case of Pyawt Ywar Pump irrigation projet area, Myinmu Township. (2) Economic analysis of the marketing activities of Mung bean in Tatkon and Pyinmana Townships. (4) Value added processing opportunities and profit function of groundnut in Monywa Township. (6) Contract farming system on sesame supply chain in Aung Lan Township, Magway Region. (7) Study on livelihood and microfinance situation under the SMU project in Nay Pyi Taw. (8) Adopting of improved sesame varieties and technology package in Magway Township. (9) Effect of labor substitution harvesting practice on Mung bean production in Bago Region. (2) Migration pattern of rubber plantation farm households in Mon State funded by CARE Myanmar. (4) Economic analysis of the marketing activities of Mung bean in Tatkon and Pyinmana Townships funded by JICA-TCP. (5) Investigating the migration patterns, gender perception and migrant remittance on rural household development in Myawaddy Township funded by ACIAR. (6) Consumer survey for “Study on consumer preferences in regards to organic, clean and safe (agroecological) agri-food products in the Greater Mekong Sub-region” funded by GRET. (6) “Improvement on accessibility of rice certified seed” project funded by JICA (Yangon). During the second quarter of 2017-2018 fiscal year, DAE also assigned 1 acre for summer paddy production to agricultural economics specialized fourth year undergraduate students. During January 2018 (1-31 Jan), the activities such as land preparation, irrigation, seeding with manual seeder, In cleaning the field were done and urea fertilizer application were also done in 22nd February 2018 by the agricultural economics specialized fourth year undergraduate students under guidance of DAE. In addition, 5 acre summer paddy production are also assigned for first year undergraduate students. During the first quarter of 2017-2018 fiscal year, DAE conducted the interviews with farmers who did land consolidation and who didn’t do land consolidation in Taungoo and Oaktwin Townships, Bagon Region as the education training program for agricultural economics specialized fourth year undergraduate students. Teaching staffs of DAE also went a trip to Loikaw, Kayar State in order to know the marketing activities and market situations of commercial crops in that area. Moreover, the fourth year undergraduate students are assigned to attend the pre-training on tractor and agricultural machinery driving and management course during second quarter of 2017-2018 fiscal year. (1) Dr. Theingi Myint attended “RED+++ Policy Roundt -able” at Thingaha Hotel, Nay Pyi Taw on 1.4.2017 by . (2) Dr. Cho Cho San attended meeting on “Upgrading curriculum for postgraduates” with the support of India’s Higher Education and Research Institute during 10 –20 April, 2017 . (3) Dr. Yu Yu Tun, Daw Nang Ei Mon Thae and Daw Myint Myat Moe attended “Agribusiness Master Class” at Mandalay during 24-29 April, 2017. (4) Daw Thida Than, Daw Ei Mon Thida Kyaw, U Aung Phyo under the guidance of Dr. Cho Cho San and Dr. Theingi Myint offered training lecturer and practical on “Farm Management and Statistics” to improve skills of teaching staffs from State Agriculture Institutes. Daw Moh Moh also helped as assistant for that training. (5) Daw Aye Thandar attended the “Using computer, internet and email and maintenance” at Information and Technology Department, YAU during 2-12 May, 2017. (7) Daw Myint Myat Moe attended “Communication for Development” training at Information and Technology Department, YAU during 15-17 May, 2017. (8) Members of DAE attended “Workshop on curriculum development of Yezin Agricultural University” at Auditorium of YAU on 9th May, 2017. (9) Dr. Cho Cho San attended the workshop on “Agricultural Development Strategy” at MICC II, Nay Pyi Taw on 11th May, 2017. (10) Dr. Theingi Myint presented about “Assessment of supply chain management of sesame in selected areas of Myanmar” at JICA meeting held in Diamond Jubilee Hall, YAU on 11th May, 2017. (11) Dr. Theingi Myint attended workshop on “Myanmar pulses sector development strategy” at YAU on 12th May, 2017. (12) Dr. Yu Yu Tun presented the research progress about “RB 01-3: Spatial Analysis of the Marketing Activities of Mung Bean in Selected Area” and Daw Ei Mion Thida Kyaw also presented the progress report on “RC 01-2: Assessment of Supply Chain Management of Sesame in Selected Areas of Myanmar” at JICA meeting held at Diamond Jubilee Hall, YAU on 12th May, 2017. (13) Dr. Cho Cho San attended the opening ceremony of “Communication for Development” training at Diamond Jubilee Hall, YAU on 15th May, 2017. (14) Dr. Theingi Myint and Daw Thida Than attended the workshop on “Stregthening Institutional Capacity, Extension Services and Rural Livelihoods in the Central Dry Zone and Ayeyawaddy Delta Regions of Myanmar Project” at Nay Pyi Taw on 15th May, 2017. (15) Dr. Theingi Myint attended task force member meeting to discuss the planned activities according to the output of “Fifth meeting of the BIMSTEC expert group on agricultural cooperation” at Ministry of Agriculture, Livestock and Irrigation, Office Building (15), Nay Pyi Taw on 16th May, 2017. (16) Dr. Yu Yu Tun and Daw Ei Mon Thida Kyaw attended the Third Round Table: “Improving Market Access for Myanmar Vegetables” at the Thingaha Hotel, Nay Pyi Taw on 18th May, 2017. (17) Daw Khin Khin Nwe attended “How to cook Indian cuisine’ held by Art and Literature Committee of YAU on 25th June, 2017. (18) Dr. Yu Yu Tun attended “International Workshop on advanced production technology, quality and capacity building” held at China from 11-30 June, 2017. (7) Dr. Aye Moe San attended the workshop on “Knowledge Sharing Program (KSP) Final Meeting” at Park Royal Hotel, Nay Pyi Taw on 9th June 2017. (21) Dr. Theingi Myint attended the workshop on “Regional Experience Sharing on Indigenous People Engagement in REDD+++” at Horizon Lake View Hotel, Nay Pyi Taw during 19-20 June, 2017. (22) Dr. Theingi Myint attended the workshops on “Impact of climate change on Food Security” and “Exchange program for Agricultural Technology” at Putra Jara, Malaysia from 17-20 July, 2017. (23) Dr. Yu Yu Tun attended “Food Value Chain” workshop at Office Building (15), MOALI on 5th July, 2017. (24) Dr. Yu Yu Tun attended meeting on “Certified Project Manager as a Professional Presentation” at Office Building 915), MOALI on 6th July, 2017. (25) Dr. Shwe Mar Than attended workshop on “15th survey on Green House Gas in Asia Region” held at Hilton Hotel, Nay Pyi Taw from 11-14 July, 2017. (26) Dr. Shwe Mar Than offered training lecture about agribusiness related issues to staffs of Department of Agriculture and farmers in Taungoo, Bago, Tharyarwaddy and Pyay Districts from 21-24 July, 2017. (27) Dr. Cho Cho San, Dr. Theingi Myint, Dr. Shwe Mar Than and Dr. Yu Yu Tun attended the workshop on “The Inaugural Function of the Stakeholder on New Postgraduate Curricula” at YAU on 28th July, 2017. (28) Dr. Theingi Myint and Daw Nang Ei Mon Thae attended roundtable meeting on “Market Development of Buffalo, Cattle and Beef in Southeast Asia and China at Present and Future” at Hanoi, Vietnam from 10-11 August, 2017. (29) Dr. Shwe Mar Than attended “First Policy Talk” held at Office Building (15), MOALI on 1st August, 2017. (30) Dr. Shwe Mar Than attended the meeting on “Fertilizer Strategy” at Office Building (15), MOALI on 3rd August, 2017. (31) Dr. Shwe Mar Than attended the meeting on “Agricultural Development Strategy” at Office Building (15), MOALI on 23rd August, 2017. (32) Dr. Theingi Myint attended “Second Policy Free Talk” held at Office Building (15), MOALI on 24th August, 2017. (33) Dr. Theingi Myint attended the “Regional Meeting of Consumer Preferences on Safety Foods and Agricultural Products in Greater Mekong Sub-Region” at Vientiane, Laos from 11-15 September, 2017. (34) Dr. Aye Moe San attended the workshop on “Questionnaire Preparation for Seed, Fertilizers, Pesticides, and Fungicide Usages in Watermelon and Muskmelproduction” at Office Building (32), Nay Pyi Taw on 1st September, 2017. (35) Dr. Theingi Myint and Daw Nang Ei Mon Thae attended meeting for “Analysis on Rice Production in Myanmar” at Office Building (15), MOALI on 8th September, 2017. (36) Dr. Theingi Myint attended “Concept Note for Myanmar NFI/NFMIS Projet Appraisal Workshop” at Thingaha Hotel, Nay Pyi Taw on 19th September, 2017.
on Southern La nina Changes on Agriculture and Food” at Hilton Hotel, Nay Pyi Taw on 19th September, 2017. (38) Dr. Theingi Myint attended “Third Policy Talk on Use of Inclusive Multi-Stakeholder Consultation Processess for Development of Policy and Law” at Office Building (15), MOALI on 22nd September, 2017. (39) Dr. Theingi Myint attended the REDD+++ meeting and gave lecture on “Drivers of Deforestation and Forest Degradation” at TOT training held at Horizon Lake View Hotel, Nay Pyi Taw on 28th September, 2017. (1) Daw Soe Soe Win and Daw Thida Than attended the training on “Enhancing the teaching and research methodology competencies of academic staff at YAU” at Diamond Jubilee Hall, YAU from 9-13 October, 2017. (2) Dr. Aye Moe San attended the workshop on “Challenges, prospects and quality assurance for universities in Southeast Asia and Vietnam” at Hanoi, Vietnam from 14 –15 October 2017. (3) U Saw Yan Naing attended “Modern Agricultural Technology Workshop” at Yunnan Academy of Agriculture, China from 22nd October to 5th November, 2017. (4) Dr. Theingi Myint participated “Improving Food Security and Farmer Livelihood s in Myanmar Final Program Showcase” at Lake Garden Hotel, Nay Pyi Taw from 9-14 October, 2017. (5) Dr. Cho Cho San and Dr. Theingi Myint attended “World Food Day” ceremony at YAU and Daw Soe Soe Win and U Saw Yan Naing took responsibilities to display the research documents of DAE on 16th October, 2017. (6) Dr. Yu Yu Tun attended the meeting on ‘Survey Activities on Food Value Chain” at Office Building (15), MOALI on 23rd October, 2017. (7) Dr. Theingi Myint, Dr. Yu Yu Tun, Daw Nang Ei Mon Thae, Dr. Aye Moe San, Daw Myint Myat Moe, and Daw Thuzar Myint participated the training on “Agricultural Policy Course– Thematic Issues, Policy Process and Conceptual Analysis” at DAE, YAU from 6-10 November, 2017. (8) Dr. Yu Yu Tun, Daw Thida Than and Daw Myint Myat Moe attended the training on “Rural Society Research for Rural Development” at JICA-TCP meeting room, YAU from 20th November to 3rd December, 2017. (9) Dr. Theingi Myint, Dr. Aye Moe San and U Aung Phyo attended the workshop on “ Regional Research on Sustainability of Mountain Agricultural Systems in far eastern Himalayas: A disciplinary exports’consultative workshop to understand relationships between sustainability components and SDG goal 2 indicators” at meeting room (1), YAU on 16th November, 2017. (10) Dr. Theingi Myint attended the workshop on “Institutionalization of Planning Department” at Office Building (15), MOALI on 21st November, 2017. REDD+ training” at FRI, Yezin on 28th November, 2017. (12) Dr. Theingi Myint attended the Civil Service Training (2) at Zeepingyi, Pyin Oo Lwin from 6.1.2018 to 28.2.2018. (13) Dr. Yu Yu Tun, Daw Nang Ei Mon Thae and Daw Myint Myat Moe attended training on “ Agribusiness Master Class Module 2” under leading role by HELVETAS Vietnam at Summit Park View Hotel, Yangon from 29.1.2018 to 2.2.2018. (14) Daw Soe Soe Win and Daw Thida Than attended the traiinging on “Enhancing the teaching and research methodology competencies of academic staffs at YAU” at convocation meeting room (3), YAU from 29.1.2018 to 2.2.2018. (15) Daw Honey Lynn Lynn and Dr. Aye Moe San attended “Food Value Chain” seminar at Parkroyal Hotel, Nay Pyi Taw on 30th January, 2018. (16) Daw Nang Ei Mon Thae attended the workshop on “Japan Myanmar Cooperation Dalogue for the Development of Agriculture, Fisheries and Foods” at Parkroyal Hotel, Nay Pyi Taw on 31st January, 2018. (17) Teaching staffs and postgraduate students of DAE under guidance of Dr. Cho Cho San attended the “Participatory Rural Appraisal” Course at DAE on 17th February, 2018. (18) Dr. Cho Cho San attended “Stakeholder Consultation Workshop for Preparation of Agricultural Action Plan DRR (AAPAAR)” at Royal Ace Hotel, Nay Pyi Taw on 7th February 2018. (19) U Aung Phyo presented at GRET meeting in Yangon from 22-23 February 2018. (20) Dr. Theingi Myint attended workshop on “Impact of Natural Disasters on Food Security and Exchange of Agricultural Technology” in Singapore from 25-26 March, 2018. (21) Daw Nang Ei Mon Thae and Dr. Aye Moe San attended “Agricultural Policy Course” at Office Building (15), MOALI from 27-29 March, 2018. (22) Dr. Yu Yu Tun attended workshop on “Value Chain Capacity Building Network (VCB-N)” at Laos from 27-29 March 2018. (23) Dr. Theingi Myint attended the “Myanmar Rice Forum” at MICC-2, Nay Pyi Taw on 6th March 2018. (24) Dr. Cho Cho San attended “ACIAR-YAU Granted Research Meeting” at Convocation meeting Hall (3), YAU on 11th March, 2018. (25) Teaching staffs of DAE attended “Workshop on developing credit system in YAU” and Dr. Hnin Yu Lwin presented “What to do if student fails the exam in the credit system” at Auditorium, YAU on 14th March, 2018. (12) Dr. Theingi Myint and U Aung Phyo attended “Myanmar Rubber Sector Development Forum” organized by Department of Agriculture, Worldwide Food for Nature CARE International in Myanmar and Myanmar Rubber Producer Association at Hotel Max, Nay Pyi Taw from 21-23 March, 2018.